And as Mosheh lifted up the serpent in the wilderness, even so must the Son of A’dam be lifted up: 15 That whosoever believes in him should not perish but have eternal life. At first glance, this appears easy enough. And YAHUAH said unto Mosheh: Make you a fiery serpent and set it upon a pole; and it shall come to pass, that everyone that is bitten, when he looks upon it, shall live. 9 And Mosheh made a serpent of brass, and put it upon a pole, and it came to pass, that if a serpent had bitten את eth any man, when he beheld the serpent of brass, he lived. We can see that as a man who sees the serpent on the pole would live from the serpent’s bite, so anyone who looked on the Son of A’dam being lifted up would not perish but have eternal life. Yet, there is more to the story. And YAHUAH sent את eth fiery serpents among the people, and they bit את eth the people; and much people of Yashar’el died. INTERLINEAR: And YAHUAH, he sends into the people the serpents, the seraphiym, and their strike, and the people die, many people of Yashar’el. So, it is necessary to take a closer look at the word here ha’seraphiym. The root word here is saraph (שָׂרַף) (Strong’s H8313), generally interpreted as meaning to be set on fire: to cause to burn; to make a burn or burning; to kindle. Of the 107 appearances of this word in the Tanakh, 106 times it is interpreted as burn, burnt, or burned. However, the word that actually appears here is the masculine plural seraphiym. Above it stood the Seraphiym: each one had six wings; with two he covered his face, and with two he covered his feet, and with two he did fly. 3 And one cried unto another, and said: Holy, holy, holy, is YAHUAH TSEVA’OTH: the whole earth is full of his glory. IN those days I beheld long ropes given to those angels; who took to their wings, and fled, advancing towards the north. 2 And I inquired of the angel, saying, Wherefore have they taken those long ropes, and gone forth? He said, They are gone forth to measure. 3 The angel, who proceeded with me, said, These are the measures of the righteous; and cords shall the righteous bring, that they may trust in the name of YAHUAH TSEVA’OTH forever and ever. 4 The elect shall begin to dwell with the elect. 5 And these are the measures which shall be given to belief, and shall strengthen the words of righteousness. 6 These measures shall reveal all the secrets in the depth of the earth. 7 And those who have been destroyed in the desert, and who have been devoured by the fish of the sea, and by wild beasts, shall return, and trust in the day of the Elect One; for none shall perish in the presence of YAHUAH TSEVA’OTH, nor shall any be capable of perishing. 8 Then they received the command­ment, all in the heavens above; to whom a combined power, voice, and splendour, like fire, were given. 9 And first, with voice, they blessed him, they exalted him, they glorified him with wisdom, and ascribed to him wisdom with the word, and with the breath of life. 10 Then YAHUAH TSEVA’OTH seated upon the throne of his glory the Elect One; 11 Who shall judge all the works of the holy, in heaven above, and in a balance shall he weigh their actions. And when he shall lift up his countenance to judge their secret ways in the word of the name of YAHUAH TSEVA’OTH, and their progress in the path of the righteous judgment of EL ELYON; 12 They shall all speak with united voice; and bless, glorify, exalt, and praise, in the name of YAHUAH TSEVA’OTH. 13 He shall call to every power of the heavens, to all the holy above, and to the power of ELOHIYM. The Keruviym, the Seraphiym, and the Ophaniym, all the angels of power, and all the angels of YAHUAH, namely, of the Elect One, and of the other Power, who was upon earth over the water on that day, 14 Shall raise their united voice; shall bless, glorify, praise, and exalt with the RUACH EMUNAH, with the RUACH CHOKMAH and NETSACH, with the RUACH CHECED, with the RUACH MISHPAT and SHALOM, and with the RUACH RAHTSON; all shall say with united voice; Blessed is he; and the name of YAHUAH TSEVA’OTH shall be blessed forever and ever; all, who sleep not, shall bless it in heaven above. 15 All the holy in heaven shall bless it; all the elect who dwell in the garden of life; and every ruach of light, who is capable of blessing, glorifying, exalting, and praising your holy name; and all flesh, more than the powers shall glorify and bless your name forever and ever. The angels of power . . . that is a bit different than “a fiery serpent”, is it not? And YAHUAH said unto Mosheh: Make a Saraph and set it upon a flag; and it shall come to pass, that everyone that is bitten, when he looks upon it, shall live. Num 21:8 ויאמר [v’y’amar] יהוה [YAHUAH] אל [al] משׁה [Mosheh] עשׂה [asah] לך שׂרף [lek saraph] ושׂים [v’seem - put] אתו [eth] על [al - on] נס [nase - flag] והיה [v’hayah – which is] כל [kole - all] הנשׁוך [h’nashak – strike/oppress/press] וראה [v’ra’ah – and see] אתו [eth] וחי [v’chay - life]. And YAHUAH said to Mosheh: Make a saraph and put it on a flag; and it shall come to pass, that all those who are pressed shall see and את eth-live. And Mosheh made a serpent of brass, and put it upon a pole, and it came to pass, that if a serpent had bitten את eth any man, when he beheld the serpent of brass, he lived. We have two distinct things going on here. YAHUAH tells Mosheh to put the image of a saraph on a flag – yet Mosheh puts a serpent on a pole. The saraph on a flag was a sign that all those who are pressed by YAHUAH (not a serpent) would see life. Mosheh instead provided a remedy for the serpent’s bite. This rod is known as the Rod of Asclepius, which is a rod wrapped with a single serpent belonging to the Greek god (read: fallen watcher) whose name was Asclepius. This “god” was associated with healing and medicine. He is identified as Amazarek in Chanok (Enoch) 8:3. Asclepius derived his name from healing soothingly and from deferring the withering that comes with death. For this reason, therefore, they give him a serpent as an attribute, indicating that those who avail themselves of medical science undergo a process similar to the serpent in that they grow young again after illnesses and slough off old age. 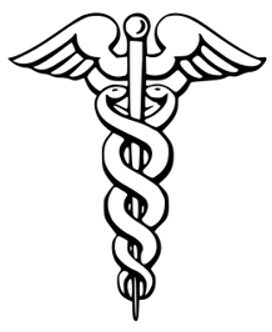 Even today, the Caduceus - the staff carried by Hermes in Greek mythology and consequently by Hermes Trismegistus in Greco-Egyptian mythology - is the symbol of healing and medicine. 8 καὶ εἶπε Κύριος πρὸς Μωυσῆν· ποίησον σεαυτῷ ὄφιν καὶ θὲς αὐτὸν ἐπὶ σημείου, καὶ ἔσται ἐὰν δάκῃ ὄφις ἄνθρωπον, πᾶς ὁ δεδηγμένος ἰδὼν αὐτὸν ζήσεται. 9 καὶ ἐποίησε Μωυσῆς ὄφιν χαλκοῦν καὶ ἔστησεν αὐτὸν ἐπὶ σημείου, καὶ ἐγένετο ὅταν ἔδακνεν ὄφις ἄνθρωπον, καὶ ἐπέβλεψεν ἐπὶ τὸν ὄφιν τὸν χαλκοῦν καὶ ἔζη. 8 And Mosheh prayed to YAHUAH [Kurios is always used for the tetragrammaton in the Septuagint] for the people; and YAHUAH said to Mosheh, Make you a serpent, and put it on a signal-[staff]; and it shall come to pass that whenever a serpent shall bite a man, every one [so] bitten that looks upon it shall live. 9 And Mosheh made a serpent of brass and put it upon a signal-[staff]: and it came to pass that whenever a serpent bit a man, and he looked on the brazen serpent, he lived. The word for serpent in the Greek is the word. ὄφις ophis (Strong’s G3789), and we see in the Septuagint verses that we have this word for serpent (ὄφις), and we see that it is used in both verse 8 and verse 9. This is a notable difference between the Septuagint and the Hebrew textus receptus. So, the question arises: Did Mosheh disobey YAHUAH and his command to make a seraph and put it on a flag? Or, is the text corrupted by those who redrafted the text after the rise of the Greek world over Yerushalayim? And YAHUAH said to Mosheh: Make a saraph and put it on a flag; and it shall come to pass, that all those YAHUAH presses shall see and את eth-live. What would this flag look like? It would have an image of a saraph, who would have six wings, full of eyes, with two he would cover his face, with two he would cover his feet, and with two he would fly. Above it stood the Seraphiym: each one had six wings; with two he covered his face, and with two he covered his feet, and with two he did fly. 3 And one cried to another, and said: Holy, holy, holy, is YAHUAH TSEVA’OTH: the whole earth is full of his glory.
. . . and in the midst of the throne, and around the throne, were four living creatures full of eyes before and behind. 7 And the first living creature was like a lion, and the second living creature like a calf, and the third living creature had a face as a man, and the fourth living creature was like a flying eagle. 8 And the four living creatures each had six wings about them; and they were full of eyes within: and they did not rest day and night, and saying: Holy, holy, holy, YAHUAH ELOHIYM TSEVA’OTH, who was, and is, and is to come.